We’ve run the new Garmin GHP10, Raymarine S1000, Simrad AP12H, and Coursemaster CM80i marine autopilots through their paces aboard our 25′ Contender test boat. A small boat autopilot is one piece of marine electronics we don’t know what we’d do without. It is simply a joy to have one of these electronic helmsman installed aboard our boat standing by at the ready to take the wheel at the push of a button. It takes us to far-off fishing holes, trolls a straight line while putting out lures, makes long trips fun instead of work, and just plain handles the steering chores when we don’t want to. Just like upgrading from a standard television set to a high definition flat screen, once you’ve done it, you see how big the difference really is and you wonder how you lived without this for so long. Just like upgrading from standard television to high definition, once you’ve done it, you see how big the difference really is and you wonder how you lived without it for so long. Autopilots are the same way, once you have one installed this particular piece of marine electronics on your boat you won’t want to own a boat without one again. Every autopilot listed above was tested aboard our 25′ center console Contender powered by a single 250 HP outboard. This boat is equipped with Seastar hydraulic steering and each autopilot was installed according to the autopilot manufacturers’ instructions. Normally we keep an autopilot installed on our boat for at least one year to complete a full evaluation. Garmin sent us the Garmin GHP10 autopilot system for long-term testing aboard our 25′ single-engine Contender. 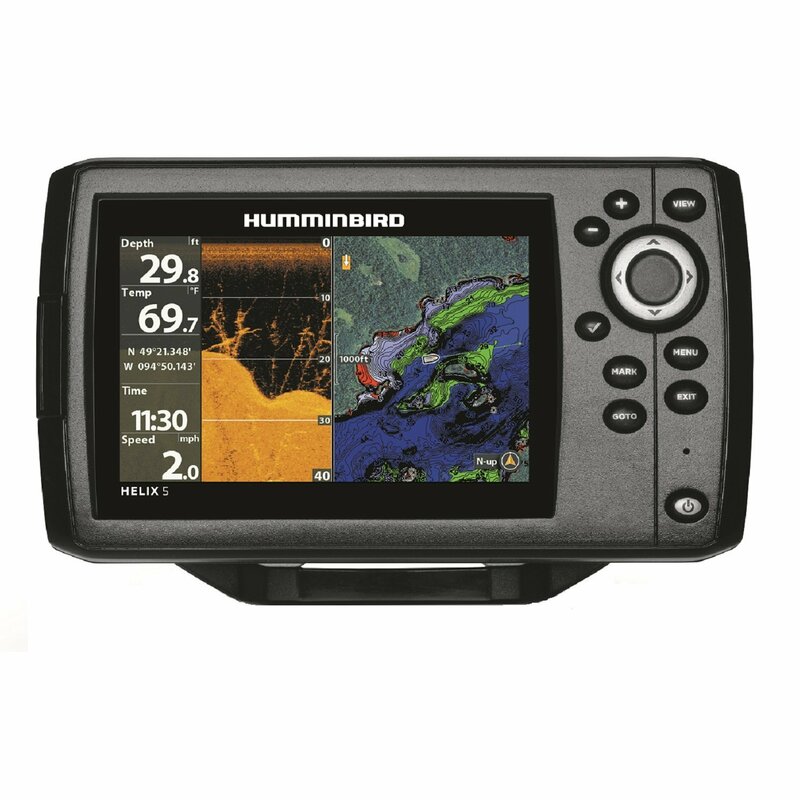 This Garmin autopilot is designed for boats up to approximately 70 feet in length equipped with hydraulic steering. Several components make up the GHP10 autopilot package; they include the Garmin GHC10 control unit, Course Computer unit (CCU), Electronic Control unit (ECU), Shadow Drive sensor, and a hydraulic pump. Three hydraulic pumps, a 1.2 L, 2.0 L, and 2.1 L, are available for this system. The appropriate pump is selected based on your engine setup and steering system. We are testing with the 2.0 L pump. Cabling to connect the components and build a NMEA 2000 network is also supplied. Thankfully, the Garmin GHP10 does not require a rudder interface unit for proper operation. In a growing trend, this autopilot is now one of several small-boat marine autopilots currently on the market that do not need a rudder interface unit to function properly. Owners with outboards who operate in saltwater will be especially happy Garmin decided to make sure this breakage-prone part was not part of this autopilot system. The first Garmin GHP10 component we installed was the pump. As recommended we found a spot on the deck below our helm station to mount the brawny well-constructed unit. We used the hydraulic hoses from our last autopilot to connect to the pump. We had to buy one extra section of hose to add the Shadow Drive sensor. The pump was fastened to the deck with four supplied screws and washers in an out-of-way location near a wire bundle and bulkheead. Next, we mounted the GHP10 ECU. It needs to be close enough to the pump so the two cables from the pump can be plugged into the ECU. We fastened the unit to the aft bulkhead of our center console with six screws just above the pump. The Garmin GHC10 control head front page has a large easy to read heading display. The next step we choose to accomplish was to mount the GHC10 control unit. We had room in the lower right corner of our existing panel. To install the unit we cut a large round hole in our StarBoard® panel and then secured the unit with four supplied screws. We had to build a NMEA 2000 backbone to connect the control head to our GPS. We used wiring supplied with the autopilot and powered the backbone from our main electronics bus bar. In our opinion, this was easy and straightforward. We found component installation easy and straightforward. If you can do a little planning and layout, drill a few holes, make basic wire connections, and use a wrench on some hydraulic hoses you can do this install. We accomplished initial testing on the Garmin GHP 10 at the dock by following a simple menu. Once you confirm your engine turns the commanded direction and the tachometer feed works right youre ready to hit the water. Before you can start using the autopilot youll need to follow another menu to do the initial at-sea setup. We followed it step by step through various throttle settings and turns with no problem. Total time was about 10 minutes. In heading hold with the pilot engaged. The desired course is the yellow bug and the boat heading is the blue triangle. You change the desired heading with the softkeys below arrows. The red standby key disengages the autopilot. Next we gave the Garmin GHP10 a quick test to see how it followed a course. Even though the wind was blowing hard we found a bay with relatively calm seas for our initial testing. We were impressed with our first test run as the autopilot tracked nice and straight holding course well. To dodge an object in the water you simply turn the wheel as needed. The Shadow Drive momentarily disconnects the autopilot and gives you control. When you’re clear you return to your original course and in a few seconds the autopilot takes control again automatically. We found it to be a very nice feature. On our next gear test outing we paired up with another boat and left for a multi-day fishing trip out to the west of Key West. Here we used the Garmin GHP 10 more in a variety of sea conditions including winds in excess of 25 knots and seas over 5 feet. Even under those conditions the pilot tracked very well, though not perfectly straight it did well in the rough and tumble sea conditions. Several weeks later, at the request of a reader, we did some additional slow speed testing with the Garmin GHP10. Normally our Contender idles along at about 3.5 knots, at this speed the autopilot held heading rock steady in the calm test conditions. Next we added some drag with by throwing several 5-gallon buckets that were tied to transom into the water. This slowed us to about 1.9 knots, still the autopilot held steady on course. Finally, we went into a channel with a bit of current, kept the buckets deployed, and trimmed the engine up several degrees?all this got the GPS speed down to 1.0 knot. Still the autopilot held the heading steady under the relatively calm conditions. So far we have been pretty impressed with Garmin GHP10 capabilities. We?ll try this slow speed handling again soon in some rougher conditions and report back. To navigate to a waypoint or along a route requires the GHP10 be able to receive information from a GPS unit. We decided to hook up to the Garmin 5212 we have on our test boat via a NMEA 2000 network. Once the wiring was complete we tried to couple the autopilot to the GPS, however we were unable to do so initially because the software in our 5212 needed to be updated from version 2.5 to the latest version 4.6. Garmin sent us a card, which once inserted, allowed us to accomplish the software update in under 10 minutes. With the GPS units updated, and after turning everything off then back on again, the GPS and autopilot were talking. In GPS steering mode with the pilot engaged. In the lower right corner of the display you’ll see the off-course distance. When this number exceeds 100 feet the purple road swings the appropriate direction and turns yellow to warn you. The remaining distance to the waypoint is displayed in a box above the road. We could now see the appropriate menu selections on the GHC10 autopilot control head to navigate using GPS input. To test things out we first setup a waypoint about a mile away and engaged the Garmin GHP10 in the GPS steering mode. This requires selecting the menu, then choosing GPS steering, and finally choosing to navigate to a waypoint. Not really the easiest procedure for engagement. Hopefully in a future software update Garmin will add a GPS softkey on the front page and enable one-button navigation. Once engaged in GPS steering mode the autopilot tracked a course to the waypoint. We noticed that as we ran the boat drifted off-course up to several hundred feet. The off-course distance was indicated both on the 5212 display and on the GHC10 controller. As the boat approached within several hundred feet of the waypoint position the autopilot would turn toward the waypoint ending up passing within 10 feet of the coordinates. This happened on several passes. Garmin suggested we redo the north setting (part of the Garmin GHP10 setup procedure) since when it was originally accomplished the GPS unit and autopilot were not communicating. We will do this soon and report back here on the results. After more consultation with Garmin representatives it was determined that the autopilot software needed another update. With the navigation system using software version 4.6 and the autopilot using version 2.2 the 5212 would report a cross-track error to the right while the autopilot reported the same amount of error except to the left. This caused the navigational issues we noted. Now with the autopilot running the latest software available, version 2.4, all the navigation issues with staying on course have been solved. We tried running routes with multiple turns, changing speeds, and starting out pointed in the opposite direction; nothing seemed to phase the system. Right now things are running smoothly with rock solid course tracking. We just returned from a 620 nautical mile round trip to the Bahamas and had to report on the outstanding performance of the Garmin GHP10 autopilot. We had the unit on and following a track or route for most of the trip and found it held the boat right on course even in heavy chop and big following seas. Our crew was impressed and very happy they didn’t have to steer manually for hours a day. The only navigational issue we could see now with the Garmin GHP10 was when following a route. You’ll find the pilot will pass the turn point before it starts to track to the next waypoint. This allows some cross-track error to develop after the turn. The Garmin folks hinted that future software updates will have more advanced algorithms that will allow the autopilot to start a turn in a route before the vessel arrives at the turn point and more closely follow the track line. We look forward to trying this one. The Simrad AP12H autopilot package comes with a course computer, control head, compass, hydraulic pump, and linear feedback unit. Another version of this autopilot is available for boats with mechanical cable steering. Operation of the Simrad AP12H is fairly simple. With the unit turned on, the Stby/Auto LED will blink, indicating the autopilot is ready to go to work. Pressing the Stby/Auto button engages the autopilot in a course-hold mode and turns the LED on steady. Whatever course youre steering when you select the Stby/Auto button is the course the autopilot will hold. To change course one-degree, push the port or starboard arrow button once; youll get a single beep and a single flash on the associated LED to confirm the command. Hold either button down and you’ll get a 10 or more degree course change. The longer you hold the button, the more the course changes. Each 10 degrees of course change is confirmed by a double beep and double LED flash. The Simrad AP12H is also capable of navigating to a waypoint when GPS data is available. To engage the navigation mode, first select Stby/Auto then Nav. Both associated LEDs will turn on steady to indicate lock on. Gain can be adjusted in any mode: One push of the Gain button will flash the Gain LED from one to nine times, corresponding to the amount of gain currently selected. To increase gain, press the starboard arrow; to decrease, press the port arrow. We found the default gain setting of five to work well for us over a wide range of operating conditions. In seas less than 3 feet, the autopilot tracks a straight course nicely, both in the navigation mode and the course-hold mode. Occasionally gain adjustments are needed as conditions change. The arrow buttons are active in all modes and serve as a ‘dodge’ feature. This lets you maneuver around an obstacle close ahead without disconnecting the autopilot. One caution, we tested the dodge function at various gain settings and found the turns to be quite aggressive at high-gain settings. At our preferred gain setting of five, a dodge turn is smooth and effective. About 18 months into our evaluation, the autopilot failed to engage when selected. After conferring with Simrad support, we were able to diagnose the problem as a failed linear feedback unit. Its a long cylindrical part that attaches to the hydraulic steering cylinder on the engine. Our guess is that the constant exposure to salt water led to an early demise. We dont think this should have happened in such a short time and in our opinion, this part needs to be reengineered for a longer service life. Our warranty claim for the new feedback unit did not go well. Once we confirmed the problem, Simrad asked us for the autopilot serial number to determine if it was still under warranty. The company said it was not and advised us a replacement part would cost almost $400. This seemed expensive for a single piece of a $1,400 autopilot system. So once we got over the shock of the repair cost, we began to research the situation and discovered that our unit should still be within the 2-year warranty based on our purchase date. Simrad calculates the warranty date by adding three months to the time the unit is shipped to a retailer. In our case, the retailer actually had the unit in stock far longer. We dug out our receipt and made a copy. Simrad required it before it would honor the warranty claim. With proof in hand, Simrad agreed to ship us the part but not without making us jump through one more hoop. We had to pony up the money for the part and then wait for Simrad to credit us. Another big issue with the Simrad AP12H is a noisy hydraulic pump. We installed the Simrad autopilot’s pump about 18 inches below our helm station and through-bolted it to the center console’s aft bulkhead. That puts it about shin high to the driver and totally contained inside the center console location that made accessing and connecting to the existing steering lines easy. At slow speeds, the pump is loud enough to interfere with conversation and always draws comments from passengers. Even at cruising speed, the pump can be heard. Simrad’s Phil Roberts explained why the pump is so loud. “The pump noise is related to how it pumps. This one is a piston type. We do not manufacture it. Our other autopilots use meshing gears which tend to be quieter” says Mr. Roberts. The Simrad AP12H Autopilot performed well over the course of two years, but the noisy pump is a definite drawback. We were also disappointed in the early failure of the feedback unit and complex warranty procedure. When we bought the Simrad AP12H, it was the least expensive autopilot we could find. Today it remains an inexpensive small boat autopilot priced around $1,400 at a variety of online marine electronics retailers. Raymarine loaned us the Raymarine S1000 autopilot for long-term testing aboard our 25′ single-engine Contender. This Raymarine autopilot is designed for boats up to 25′ long equipped with hydraulic steering so our Contender fit the bill perfectly. Three components make up the S1000 autopilot package, the wireless Raymarine S100 controller, the course computer, and the hydraulic pump. There is no rudder interface unit or rate gyro required for operation of this autopilot system. The Raymarine S1000 is one of just a few small-boat autopilots currently on the market that does not need a rudder interface to function properly. Operating the Raymarine S1000 is simple. First, power is switched on to the course computer and pump, then a press of the standby pushbutton on the S100 controller turns it on and establishes the wireless connection the course computer. The system runs through an initialization process and checks for a minimum boat speed of at least three knots. Two main modes of operation are available for enroute navigation. Auto mode is basic heading hold, while track uses data from the GPS to steer a course to a waypoint. Three other modes, zigzag, circle, and clover can be used to maneuver around the area near one of your fishing spots. The right or left arrow buttons produce course changes as needed. A single press will change the selected course by one degree. Holding an arrow key down will cause the autopilot to execute a controlled turn in the direction selected. Navigating to a waypoint or along a route is the most useful aspect of any autopilot’s operation. The S1000 accomplishes this task through its Track mode. Navigational information is provided to the autopilot via a hardwired NMEA 0183 link to the Garmin 5212 navigation system. With the autopilot on and in standby, our standard procedure for initiating Track mode was to turn on course, select Pilot, wait for the autopilot to display an acceptance message, then hit the Pilot pushbutton again to complete engagement. The S1000 autopilot does a very good job of tracking a course to a waypoint using this technique both in calm and rough seas. After over 18-months of service aboard our test boat this Raymarine autopilot is operating like it was still new. The only thing we have had to do is change the pair of AAA batteries that supply power for the Raymarine S100 controller. We have had no mechanical problems with any system component. This Raymarine autopilot carries a two-year warranty. The S1000 is an inexpensive utilitarian autopilot that does a very good job handling steering duties. It will track a course or go to a single waypoint or steer the heading of your choice. In our opinion, this autopilot is a great asset for any small boat helmsman. Coursemaster Hydrive loaned us the Coursemaster CM80i autopilot for a year-long review as part of our continuing program of testing and rating small boat marine autopilots. Four components make up the standard Coursemaster CM80i autopilot system: the control/display head, junction box, hydraulic pump/drive, and a fluxgate compass. Another optional component, which was included with our test system, is a rate gyro. According to Coursemaster literature, adding this unit smoothes the ride by counteracting acceleration effects caused by excessive vessel movement. The Coursemaster CM80i is one of just a few small boat autopilots currently on the market that do not need a rudder interface to function properly. Another benefit of not needing a rudder interface unit is the adaptability of the pilot. Though it was designed primarily for hydraulically steered outboard powered boats between 18 and 32 feet, it can be used on boats equipped with stern drives, straight inboards, or even sailboats. Operating the CM80i is easy. Once power is supplied to the system by pressing the Stby button, a self-test is performed. When complete, the display window in the control head will read ‘Stby,’ the current course is shown in a large type size, and the selected course is displayed in smaller size. Pressing the Pilot button once engages the autopilot in a course-hold mode and changes the annunciation to read ‘Pilot’. The selected course becomes whatever your current course was when you hit the button. Press the right or left arrow buttons to change course without disconnecting the autopilot. A single press will change the selected course by one degree. Holding an arrow key down will change course in 10-degree increments continuously. All course changes selected will be displayed as they are entered to allow the operator to accurately monitor turn progress. Navigating to waypoints or along routes is a very useful aspect in any autopilot’s operation and the CM80i accomplishes this task through its Auto-Navigation mode. On our test boat, the GPS receiver was coupled to the autopilot. This allowed us to use and test the navigation feature thoroughly and completely. Our standard procedure for initiating Navigation mode was to turn on course, select Pilot (course-hold) mode, then hold the Pilot button for two beeps until ‘Nav’ is annunciated on the control heads display window. The autopilot did very well holding a course to a waypoint using this technique both in calm and rough seas. While in Nav mode, the arrow keys are disabled. Unfortunately the unit does not have a built-in ‘dodge’ function. To avoid an obstruction close ahead while operating in Nav, requires the helmsmen to press the Pilot button once, disengaging Nav, then maneuver using the arrow buttons as needed. To recapture the Nav course, either maneuver back on course manually with the arrow buttons or simply hold down the Pilot button until Nav re-engages. Both methods work. Unlike some other autopilots, the Coursemaster CM80i does not have multi-level gain control; instead the unit has a normal or rough water mode of operation. We’ve found the normal mode worked well on our Contender under all conditions. After 1-year of operation aboard our test boat the Coursemaster CM80i autopilot has proven to be totally reliable. We have had no mechanical problems with any system component. The Coursemaster CM80i is a no-frills marine autopilot that does a good job handling steering duties. It will track a course or go to a waypoint. Both of these tasks are performed well. Two additional upsides we’ve found with this system are extremely quiet operation and its lack of rudder-interface hardware. This autopilot is significantly more expensive than other autopilots we’ve tested. We’ve found it on the web priced at $2995. It carries a 1-year warranty.